As is the case with humans, water therapy is incredibly beneficial for pet rehabilitation. Our pool provides us with the perfect environment to exercise patients. Due to water resistance, a 15- to 20-minute session is comparable to a fast run outdoors, but without the negative impact on the joints. Pets use a variety of muscle groups in the water, therefore giving them a more well-rounded, complete workout that they would receive from a run outdoors. Additionally, swimming helps to relax tight muscles and release endorphins. Endorphins are a natural pain killer and they stimulate the release of serotonin. Put simply, swimming tends to make pets happy. 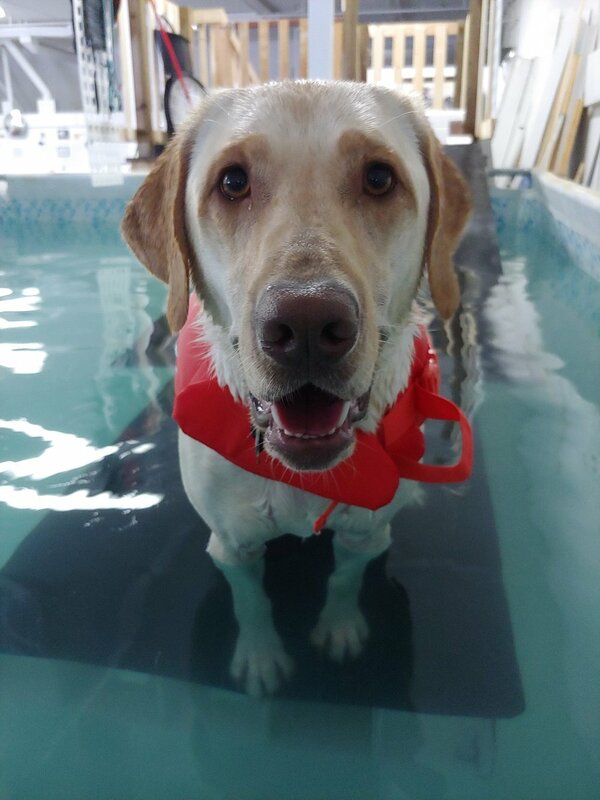 Water therapy is ideal for pets recovering from surgery, older pets with arthritis or mobility issues, and dogs with most types of paralysis. However, the benefits of full body conditioning through swimming make it a valid therapy for any pet. Swimming is a great form of exercise for every pet, regardless of their age and health status. As a rehabilitation modality, it is particularly beneficial for pets with arthritis, for those who are recovering from orthopedic surgery, pets with neurologic disorders, geriatric pets and overweight pets. However, swimming is also great for young healthy dogs who enjoy a fun way for exercise and conditioning. · Hydrostatic pressure – the pressure of the water on the limbs and body under water provides a support similar to an all-over support hose! This is particularly good for relieving any swelling, but because of this property of water, dogs with a respiratory or cardiac condition are not advised to swim due to the pressure against the chest wall. · Viscosity – this property provides the resistance to movement – it gives friction. Water provides much more resistance than air giving us more exercise in a shorter time without overly stressing the joints with percussion. The resistance is on all planes of movement, so the dog is working multiple sets of muscles at the same time – each movement is concentric and eccentric. On land, gravity assists so the muscles are used more in one direction than the other. It also slows any ballistic movement, which decreases the chance of injury. · Buoyancy – the force that allows a body less dense than water to float. This means that the effects of gravity are greatly decreased – the body’s weight is reduced by 75% – 90%, depending on one’s body type (density), and how deep one is immersed. (Muscle is denser than fat, which is why heavily muscled dogs are less buoyant.) This force allows dogs to exercise without putting weight or percussive stress on the joints.